Firstly, it’s a tedious task to charge your phone before you want to move out. Secondly, we get bored easily when we can’t do our work on the phone or laptop when they run out of battery, thirdly, we can’t leave our precious phone on the socket all the time, fourthly, we have to check our phone frequently to know how much time is more required to get the phone fully charged, fourthly, if you find out your phone charging is getting slower than usual and your charger is deteriorating; you will be doomed. However, I have a single solution for all these problems and you can get over it all at once; the best portable chargers is the ultimate fix for this hassle, gives you true freedom from the wall. Check out these latest best portable chargers 2019 or power banks at good prices. How much important portable chargers are? How to charge a power bank? A. Top portable chargers for iPhone, Samsung Galaxy series phones, iPad, Tablet etc. Anker is serving worldwide for many years in the charging technology. The most popular products are portable chargers, wall chargers, car chargers and USB cables. Anker PowerCore power bank 10,000mah is a one port portable charger, let’s have a look to its features. Anker PowerCore power bank 10,000mah guarantees safe and sound dual charging speed to your devices. This power bank for iPhone is the pick of the year in Anker PowerCore family. Combines with PowerIQ and voltage Boost Technology. Further, it can provide 3.5 times charge to your iPhone 8 and 2.5 times charging to Samsung Galaxy S8. In addition, it comes with one input; max 2 amps, it requires five hours to get a full charge. Though it offers one USB port to charge your device, yet it provides a high-speed universal charging no matter what. Besides, it comes with a lithium polymer battery; the best battery so far. It is extremely portable; you hardly feel it in your pocket. Nevertheless, this power bank is not so suitable to charge your laptop or tablet with its 10,000mah battery. If you want to charge your laptop too, then jump to RYNEP power bank 50000mah without any delay; it is our favorite pick in the range of the best portable chargers for a laptop. But if you want to charge your phone and tablet with more than one port facility then Anker power core 26,800mah portable charger; sound perfect for you. However, keep in mind, where there its portability and design are the most positive features; we really get impressed of, yet, it is a single port charger; allows you to charge only one device at a time. Then again, it has no Qualcomm Quick Charge Technology to supports a quick charge and saves your time. Plus, you have to wait for the power bank to get recharged first, once it is charged, then unplug it, only then it is ready to charge your device; since it has no pass-through charging technology. A very simple and a decent way of quick boost to your only cell phone. This power bank for iPhone not only fulfills its promises but proofs a perfect companion with its one port without any hassle. Ravpower has recently upgraded themselves with Hyperair Technology. They are known as an expert in delivering safe and faster-charging experience over the world. However, Ravpower portable charger has three ports; able to charge three devices simultaneously. Let’s check out its features. The Ravpower portable charger is much cheaper than Anker power core, with three USB port facility and much bigger battery i.e. 32,000mah. Indeed it is most suitable for smartphones; ranked second in all of the best portable chargers for the iPhone series. With 3 iSmart 2.0 USB ports, you can charge your iPhone X up to 7 times, Samsung S8 up to 6 times, iPad mini four times, or an iPad Pro up to 2 times. Further, it offers fast and safe charging; takes halve time as compared to other standard chargers in the market. Then, Ravpower portable charger has round edges fine design perfect to hold in hand and carry anywhere you want. 60% fast recharging with a DC 5V/2A or DC 5V/2.4A AC charger. Further, it is made up of a solid casing, that makes it somehow weatherproof and can hold itself in every condition. No matter if you are an athlete, in the army or if you need an indoor power boost, Ravpower portable charger helps you to great extent. In addition, there are four mini LED lights; that keeps you updated of the remaining power this portable charger holds for you. One solid LED means there is 25% of the battery remains, likewise, two indicates 50%, three indicates 75% and four indicates 100% of the remaining power. Despite all the features and peculiarities it offers, there are few limitations and drawbacks. Remember Ravpower portable charger supports 160wh (watt-hours) that is greater than 100wh limit by the FAA (Federal Aviation Administration), prohibit you to bring this power bank along with you on the flight, unless that particular Airline let you pass with it on the check. Then again, it is little heavier to carry, however, this can be passed; because of the huge battery power, it has. It is an excellent piece to carry if you are working far from standard power suppliers. With its three ports, this portable charger works good and wouldn’t disappoint you, any time you want to use it. Anker is the world best portable charger manufacturer no doubt, remarkably a pro in fast charging technology and a huge power supporter. Anker powercore 26800mah with three ports, is much greater in terms of holding power than the Anker powercore 1000mah with the single port. Certainly, it is the another best portable charger from the Anker. Let’s check out the features. Anker power bank has a fast-charging colossal capacity with its most compatible battery pack. Due to its round edge sleek design and huge battery, it ranks third in our list of the best portable chargers 2019. It can provide almost 10 iPhones 6 times battery charge, tablet almost 2 times and all the other USB devices multiple times. With double recharging speed, it has dual micro-USB input ports gives 3 USB output ports, fits with Ankers PowerIQ and voltage boost technology; makes 3 devices charge simultaneously. Whereas, this power bank requires 6 hours to charge itself (if you use both micro USB input), otherwise, it will take 8 to 9 hours by using single input. Once it is fully charged, you get a strong backup anytime anywhere. Then there are LED lights, keep you aware of the remaining battery it holds. In case they are not working, there is a separate button on the side; you can press it to make these LED live to check the battery status. Although Anker Powercore 26800mah can charge two times faster, still it doesn’t support Qualcomm Quick Charge (what is Qualcomm Quick Charge Technology? Check the buyer’s guide). Further, this power bank is not compatible with devices like Bluetooth, chargeable earbuds and earphones and GPS devices. If you want to buy Anker but more than just one port, than this sounds perfect for you. I personally like this portable charger; with its three port, it can facilitate you more than enough. EC Technology strives to offer high-quality electronic products and are pro in introducing remarkable designs in their products, no one has done before. With its long polymer battery life, this is the third generation power bank by EC Technology stands on the fourth position in the battalion of our best portable chargers of the year. EC Technology Portable Charger is able to power up all 5V devices, for instance, mobile phones, tablets, MP3 players and PSP (not so compatible with laptops). Easy to recharge in a short time period and easy to charge your devices. In fact, it can give your iPhone 7 about 9 charges, iPad 2 charges, and Samsung S7 up to 6 charges from its 3 iSmart USB ports and it has two input ports to get recharge; takes almost 11 hours with 2 amp charger. Further, it provides your device a safe charge from any charging accident and vulnerabilities. In addition, there are four LED flashlights; indicate your device charging status all the time while in use. One solid light indicates 0% to 25% remaining battery, two indicates 26% to 50%, three indicates 51% to 75% and four indicates 76% to 100% power remains in the power bank. Further, its casing is made up of the fire retardant plastic; prevents from any fire accident at the outdoor under the sunlight. But not a waterproof battery charger. Apart from all the great features it brings, there are few drawbacks as well. The one is it doesn’t support Qualcomm Quick Charge Technology, that’s the reason we have witnessed slow charging speed in the three months testing period; almost takes 10-12 hours for 100% recharge of the power bank. Huge power backup plus more than one port facility; works remarkably. Its affordability is another addition in its attractive features. Dulla is a well-known manufacturer and extremely popular in offering their prestigious services in electronic devices. With their mission to improve the life of their customers and give them ease, they are climbing incredibly high. Dulla portable charger offers two output ports. Dulla portable power bank is covered with high-quality aluminium alloy casing. It ensures the durability and smooth surface, you wouldn’t be disappointed if it hits the ground accidentally. Surely most suitable for smartphones. It can charge your iPhone 7 up to 5 times. Further, it has a power manager system that keeps your device safe while charging; prevents from overcharging, over-discharging and short circuit accidents. Further, it has LED lights which indicates your device charging status. Has only two USB ports to charge your devices simultaneously. This will cost you less than $25 and extremely portable than other chargers. If you are excited for the camping, then don’t forget to bring Dulla portable charger with you. It has an extra flashlight that is quite bright and can facilitate you greatly in case of darkness. However, the compatible devices are Samsung Galaxy s7, s6 and edge, iPhone 7, Plus 6, 6s Plus,5, 5s, 4, 4s, Blackberry, HTC, Huawei, iPad, iPod, PSP, Tablets, MAC and MP3, MP4 players etc. Be aware, what we have experienced is, it has slow charging speed to these devices, relatively. There is no Qualcomm Quick Charge Technology. Plus, Dulla portable charger is not designed to refill your laptop and other heavy power consuming devices. Extremely portable and affordable. Marvelous design and body structure, this is the fifth best portable charger I come across so far. Fandazzie device charging mat is one of the best portable charger of the year. No plug ins, no bulginess, just put your phone on its surface and leave it on its own to get charge. In short, Fandazzie wireless charging mat provides you the most effective way to charge your phone even on the go. Fandazzie wireless charging pad is extremely portable and ultra slim in shape similar to your smartphone ; able to adjust in your pocket just the way you tuck your phone. Further, this wireless charging pad is a consumer-friendly charging mat, prevents your precious phone from getting hot while on charge and prevents your phone from overcharge if you leave the phone on the charging pad overnight. However, it is the most reliable source of wireless charging even on the go. You can put this pad anywhere such as n the dashboard of the car while driving, on your desk while working at the office etc. Despite all, keep in your mind; not to use any other USB cable to charge this wireless device charging pad, charge it with only the provided micro USB cable, otherwise it might reduce its performance the way it should be. Certainly, Fandazzie is the best portable charger and the most effective way to boost your phone wherever and whenever you want, though it provide you two charges in overall, yet it is efficient way than any other. RYNEP is famous for its smart and fast charging technology over the globe. RYNEP Power Bank 50000mah can charge your four devices, simultaneously. You can connect all four once and put them aside to get fully charge, absolutely no disappointment when RYNEP is there. This is my all time favorite power bank for a laptop. With its extremely powerful battery of 50,000mah, it holds the first position in the best portable chargers and a rare piece in the range of laptop chargers specifically, as well as most suitable for phones and tablets at the same time. RYNEP has outstanding performance and acts like a pro for battery thirsty devices at camping. It’s a savior, no doubt. It allows you to charge your smartphones 10 to 12 times, tablet 7 to 10 times and laptop up to 2 times. It comes with 28 laptop connectors, offers 2 USB outlets to charge your devices with 5V, 9V 12V. Further, it has type C output to charge 5V digital devices with type C input. DC output by which you can charge devices of 5V,8.4V, 9V, 12V, 16V (six adjustable voltages). However, RYNEP power bank for laptop requires a minimum time of five hours to fully charge, comparatively. This is a very high capacity power bank, with an aluminium alloy casing and with an OLED screen; that displays the voltage it is taking, whilst charging itself and how much remaining power is there to further charge any of your devices. If you are afraid of the short circuit, overcharging and all those vulnerabilities that might cause your device to be damaged, then you should keep in mind that RYNEP power bank can look after all these too efficiently with the help of intelligent power manage IC technology it has. Apart from being the best portable charger 2019, RYNEP power bank has some peculiarities, one of them is; you have to have set the required amount of voltage for your device, manually, since it has no iSmart technology and there is no pass-through charging technology. Nevertheless, we are pretty much satisfied with this great battery power; who is always ready to boost your phones, laptops and many other devices. I am in love with this portable charger. I bought this few months back and it is working great. Its extraordinary features are its multiports; always ready to boost your devices anytime and anywhere. MAXOAK is one of the largest scale battery manufacturer in China. A leader of Li-polymer battery and advanced electronic devices. Further, they have a monopoly in dealing with leading electronic companies of the world. Let’s check out the features of the MAXOAK 50000mah power bank. MAXOAK power bank for laptops is the second best portable charger with the ultra-high capacity of 5000mah huge battery. MAXOAK power bank is the most compatible portable charger for laptops of max 130-watt capacity. Comes with 14 connectors for a variety of laptops and digital devices. MAXOAK power bank is not only perfect for laptops but can easily charge and give a quick boost to a number of smartphones,iPad, iPad, and many more. You can charge your 65W laptop up to 2 times, iPhones X, 8 Plus, 7Plus, 6 Plus 11 times, iPhone8,7, 6 can be charged up to 16 times, iPad mini 3 can be charged up to 4.5 times and Samsung Galaxy S6 up to 11 times. There are total 6 output ports; one of them is for the laptop with 20V and 5A, the second output port is 12V and 2.5A compatible for digital cameras and routers, whereas two more ports of 5V 2.1A and 5V 1A for smartphones, iPad, tablets and for other USB devices. Further, there is a pass-through charging technology, by which MAXOAK power bank can charge and discharge at the same time. In contrast to the RYNEP power bank, it is more costly with same 50,000mah battery, but this can easily be ruled out because of the 6 ports facility. MAXOAK power bank doesn’t support several devices, for instance, it will not charge Surface Pro 4 (in case of 15V DC), though, it can charge Surface Pro 4 of 12V DC and Surface Pro 3. Similarly, it is incompatible with Lenovo yoga 3, 14, 900 (of 20V and 3.21A) and (20V 2A), but can easily charge your Lenovo t430. Not supportive to any C-type laptops, like; Dell XPS 12 and Apple laptops. Another fact, to keep in mind is, it is not Air traveling supportive, because of 185wh capacity. Six ports with six devices charging capability. A good support whenever you want and keep your devices live even on the go. Chargetech is exceptionally great in manufacturing the most powerful and long life batteries; keep your gadgets live, regardless of the location and time. Their most popular products include; wireless chargers, car chargers and USB cables. Let’s check out the latest features and properties of the portable charger by the Chargetech. The chargetech power bank stands on the third position in our list of the best portable chargers. It is a fine deal with its ultimate compact design and super portability. Perfect choice to make if you are visiting business venues with your laptop or on a road trip with your friends and family; this power bank will be a savior among your colleagues and friends. You can share a port with your friend’s power deprived laptops anytime. Further, You can charge this battery pack with the solar panel if you want a wireless charging (sold separately). There are two AC wall outlets and USB type C outlet. Therefore, you can plug any of your devices and power up to 250W from this type C outlet with so much ease. For instance, you can charge not only mobile phones, laptops, Mac, tablets, but a light bulb, portable fan, electric picnic coolers, cameras, drones, medical devices, like; CPAP and portable printers, PS4, television and so on. In addition, power bank has a facility to reserve power by a switch in order to divert the power from AC outlet to USB port to save the battery and let you charge your USB devices ultimately. The two USB ports are able to charge two times faster than any standard charger, one C type USB and two AC outlets. Allows you to charge your devices while the battery pack is on charging itself, all because of its pass-through charging technology. Moreover, it ensures safe charging for your devices and has OLED flashlight to show battery status all the time. Chargetech portable charger is a huge battery pack with its premium tesla battery cells, 42000mah 250W and 110V, hence, not suitable to take on fights, as it exceeds the limit set by FAA. what’s more, is it is little heavy to carry, not for pocket but still a compatible size to tuck it in your backpack. Best portable charger with numerous ports. Keep your phones and laptops batteries fill with its fast charging technology within no time. Omnicharge was launched on IndieGoGo in 2016. In this shortest period of time they have climbed up so far and making their way so quickly in the tech world. Their goal is to serve their customers uncompromisingly. However, Omnicharge portable charger 20400mah is the most reliable source to refill your power deprived devices. Our best pick in the range of power stations with AC/DC outlet. Omnicharge portable charger is a perfect power bank portable charger to charge your DSLR, laptop, MacBook, drone cameras, projectors, tablets, portable monitors and other devices. Omnicharge portable charger is the most flexible and reliable source of power supply, with OLED screen and the fast-charging USB ports,i.e. AC outlet offers up to 100W 120V to multiple devices and DC output offers 1V to 24V max 70W; can charge your iPhone and Samsung Galaxy 5 to 9 times. The most compatible devices are MacBook Pro/Air, game consoles, Microsoft Surface Pro 3/ 4 and laptops from Dell, Lenovo, HP. Further, there is pass-through charging technology; you can charge on the go. And when it comes to recharging this power station, it can be charged from almost any nearby source and accept up to 45W 36V, from 12V car outlet, solar panel, USB chargers, AC wall chargers and laptop chargers with the suitable power adaptor; takes only 3 hours to refill itself. In addition, Omnicharge portable charger meets all the safety standards and precautions and can be taken on the airplanes. So if you are worried about the dead batteries on your flight, get easy with Omnicharge, just tuck it in your luggage and set for the adventure or business trips. Despite all the facts and juices, it brings for you, there are some facts you need to know. Firstly, it is less likely to charge your bigger devices like portable monitors and flat televisions or all those devices greater than 100W. Secondly, it is a little more expensive than the rest of the best portable chargers we have tested. Thirdly, the OLED screen reads only incoming power whilst recharge but no outgoing power, on the go. Extremely stylish and portable. Nice fix in hand and a good juice pack for your thirsty devices for more than a day. Floureon strives to facilitate you unconditionally. Wireless chargers, walkie talkie, security cameras and other home accessories are famous products manufactured by them. Floureon Portable Power Station 42,000mah is the ultimate solution to the power deficient devices, let’s check out what it brings for you. This is the tenth best portable charger power station in our picks of 2019. If you are looking for something bigger than just a power bank than Floureon Portable Power Station is perfect to buy. Floureon power station is able to refill your iPhone 7 about 14 times, iPhone 8 up to 10 charges, laptop of 54 watts up to two charges. It can keep your table lamp (5 watts) live up to 23 hours and a mini refrigerator (50 Watt) up to 2 hours. Further, it can be charged in three different ways; AC wall outlet (6-7 hours) DC 15V 2A, 12V car charger (8-9 Hours) and through the solar panel (less than 3 hours) with suggested 30-watt to 100-watt solar panel. Whereas, requires 6 to 7 hours to have a refill for its own self. Nevertheless, it is a travel-friendly power bank with its unexpected portability and great battery backup. Able to provide you a maximum output of 250W. A very safe and effective way to power up your devices, all due to the surge protection technology. Extremely easy to carry; through carry on handle eases its portability and 1.5kg lightweight. You can bring it on your picnic points with you to charge your cameras and other necessary devices for the trip. Like any other portable charger, floureon portable power station, too have few exceptions. Firstly, you have to keep away all the metal objects from this portable power bank, for instance, coin, keys, lighters (metal coated), jewelry etc. it may cause a short circuit. Secondly, don’t place it directly under the sun when you are on camping. Thirdly, it is not a waterproof, dustproof and less likely to deal with high humidity. Huge power backup with safe and sound charging capability; this all in one power station is a nice buddy to have on, while traveling. 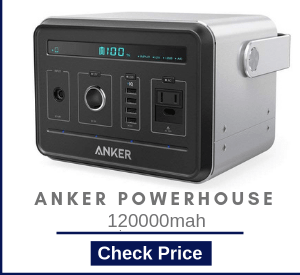 Anker power house 120000mah is the best camping and emergency backup irrespective of the prevailing situations and weather conditions, just put this in your car trunk if you are leaving for good days and about to spend this weekend on the heights of the mountain or around the lake, this portable charger wouldnt disappoint you with its huge battery capacity. Anker power house portable generator is one of the best portable chargers with the most huge and efficient battery capacity you wouldnt found anywhere else. 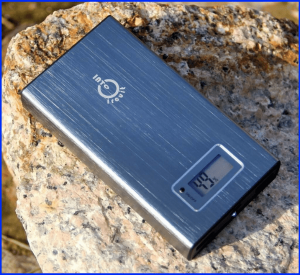 This portable charger is perfect for camping, hiking and long day journey by road, put this in your luggage and leave the rest for long, until it has juices to boost your devices, this will keep you high. Anker powerhouse portable generator is build to withstand the vigor of outdoor activities, its sturdy design and compact size made it the best portable charger with a giant backup of 400Wh lithium-ion battery in small size. Whereas, coming towards its efficiency, there is one car socket of 12V, one 110V AC to charge devices of required power up to 120W and 4 USB ports to charge multiple devices at a time. In addition, this portable generator enable the most safest and fast charge to your device, including the voltage control, protects from overheating, overcharging and prevent from short circuit. 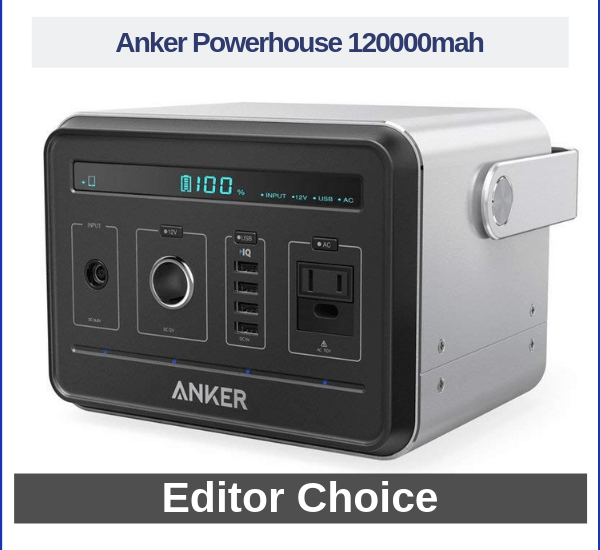 Further, Anker power house is able to charge your portable fans, mini fridge, cameras, drones, and other medical devices for emergency purpose, however, it provide 15 charges to laptop, 40 charges to your phones, 100 hours life to your table lamp of 15V and up to 7 hours to your mini fridge. There are so many remarkable features it offers to your thirsty devices, despite this, there are few limitations you need to be aware of, the one is this portable generator is not allowed to be taken on airplane (400Wh;160Wh). Furthermore, you are not allowed to charge your devices and this portable generator simultaneously, however, these are not enough to break the deal due to the more specs it offers than the shortcomings it brings. Summing up, Anker power house is capable enough to give the potent charge to your precious devices on the go regardless of the outdoor conditions, a best and reliable source of energy you can trust on when your devices lagging power. Blavor struggles and efforts greatly with its vision to offer high-quality life to their customers in terms of providing high-quality wireless chargers and solar chargers. Their most famous products vary from wireless chargers to wireless solar power banks. Blavor solar power bank is one of their premium quality product. Solar power banks are the best portable chargers for outdoor devotees who often spend their time under the sun and want their phones juicy every time without letting them to wait for batteries to be boosted. Blavor wireless charger is perfect for you if you are planning for hiking or camping. It has a lithium polymer battery. This solar portable charger can be recharged through micro USB input DC 5V 2.1A, type C input (takes 6 hours to fully recharge with a 5V 2A adaptor) or sunlight (requires 25000 luxes) (if you don’t have direct power source; especially in case of an outdoor enthusiast) and the USB output DC 5V 2.1A. Blavor wireless charger aka solar power bank portable charger is compatible with iPhone XR, XR MAX, XS, X, 8, 8 Plus and Samsung Galaxy S9, S9 Plus S8, S8 Plus and all the other iQ supported mobile devices. However, Blavor solar power bank can charge your iPhone 7 Plus up to 2.2 times, iPhone X and iPhone 8 can be boosted up to 3.5 times, iPad mini 4 up to 1.2 times, Samsung Galaxy S8 1.8 times and Samsung Galaxy S6 up to 2.5 times. In addition, Blavor solar powered battery charger is extremely durable and sturdy, it is made up of ABS plastic material; if it slips from your hand and hit the ground, no need to worry because this portable charger is covered up of splash proof material as well. There are two flashlights; helps you immensely in the darkness and a compass kit, extremely light with a hook; great for camping and road trips. Then there are wireless charging indicator, solar charging indicator, plus micro LED lights to tell you the battery status with a soft power button. In short, a perfect companion for outdoor activities, whether you are planning on a business trip, picnic, hiking or anything else you want to plan for the weekend in the open. Although it is a solar power bank and is designed to provide you power boost by collecting energy through the sun rays, we would recommend you to use sunlight a secondary source of refill to this charger. The reason is the intensity of the sunlight varies over a day, thus, prolong the time of recharge with the passage of time. However, use type C to recharge this device. It is a full proof travel-friendly power booster. More than a day fill, ready to carry and ready to have some adventure with you any time. Be-charging solar power bank is amazingly portable with its 24000mah huge battery. Perfect to carry in a pocket or put it in your luggage if you want to spend some time alone in the heights of the mountains. Allows you to charge your devices in all condition, whether you are on hiking, climbing or camping. Be-charming solar power bank charger is another solar battery charger, best if you are looking for a huge battery backup for a long journey with 24,000mah lithium battery. With three USB outlet ports of 5V 2.1A, 2A, 1A. Extremely easy to charge your iPhones and cameras on the spot, simultaneously. The best part is, that the Be-charming solar power bank charger is compatible with all the iPhones. So if you have one, then this is the best portable charger; helps you greatly in every possible situation. It is able to charge your Samsung Galaxy 7 and iPhone 6s almost six times, iPad mini three times. Further, it has LED flashlights to help you make your way in the darkness or in case of emergency. Less costly with solar panel system 5V 1W and USB input of 5V 2A.You can carry anywhere along with you easy to charge and easy use. In addition, this power bank is able to keep the energy for a week or two, if you are not using it. It ranks 12th in the list of the best portable chargers with sunlight, very stylish with its metallic design and compact size. Despite the fact it allows charging more than two devices at a time, we have witnessed slow charging as compared to other best portable chargers we have recruited. Although you can put on charge one at a time, it will refill your battery pretty fast. Another fact, it is not waterproof nor fireproof, therefore, you need to be very careful when you are on camping. It is a nice backup in case of emergency. If you found out the battery of your phone is dead when you are in a dire need of the phone, then it is the perfect power bank to bring out and fill the battery on the spot. Jeep Informant is committed to providing you wireless charging facility on your fingertips. Wireless chargers and solar charging accessories are the most famous products they offer to their customers. Jeep Informant Solar Power Bank is the 13th among the best portable chargers we have tested. Jeep Informant Solar Power Bank is an effective way to refill your mobile devices, though, not suitable to charge your laptops and other heavy gadgets. This solar portable charger comes with a strong battery power of 30,000mah, comparatively, huge power backup than rest of the solar power banks you have seen earlier. Remarkably easy to use and budget-friendly, since, it is the cheapest portable charger in our list. Suits perfect for long traveling and outdoor activities. You can enjoy your journey without worrying about your phone and camera batteries. Has two USB ports 5V 2.1A, 1A to charge your iPhones and cameras while traveling and enjoying your trip on the go. The solar panel is not for the primary source of recharge of this power bank but use it for the only emergency purpose, otherwise, use a USB cable to recharge from a wall socket; requires 18 hours to get charge through this USB input outlet of 5V 1A. Further, it has an IC cap to prevent overcharging and reduces the possibility of battery damage. Has two flashlights; helps you to navigate your way in the darkness and an attached small compass at the back. In addition, there are five mini LED lights; first green LED that is little bigger than four others tells you the power bank is on charge when placed in sunlight, whereas, the four blue LEDs let you know the remaining battery status. Solar charging is not intended for the primary source of recharge. It has to be for the only emergency purpose. We will not say it is waterproof, but a splash proof. It takes too much time to get recharged through the USB input as compared to others. This portable charger refills your batteries with so much ease and flexibility. It ensures a safe and fast boost to your devices. Power banks or portable chargers are playing a vital role in our everyday life. It is an important device just like our phones. To keep our gadgets boosted when we are using them, a best portable charger is very much needed. Without a portable charger, you wouldn’t be able to use your phone, laptops and other devices till they get back to life. However, sooner or later you will end up standing near a wall socket, taking glimpses of your device, waiting to get charged, so you can resume your work. Similarly, people who are willing to spend their weekend near a lake or climbing mountains, then pictures are a must. In such a crucial time if you find your phone or camera battery dead; it will be a great disappointment. Conversely, if you carry a power bank with yourself, then you are free of this predicament. You can do your task on laptops and phone, snap pictures irrespective of your DSLR battery status any time you want without any interruption or delay. What is the first requirement we have from our portable chargers? Obviously its portability. Portability is a must, we can’t compromise for this. It should be easy to carry, regardless of the places you want to take with you. It should be smart and lightweight to hold and compact to fit in your pocket or backpack with ease. Consequently, it all depends on the weight and size (dimension) of the power bank, as well as your need of the type of that portable charger. However, Be-charming solar power bank charger is the lightest in weight and fulfill your need impeccably. Suppose, you are at a party with friends or on a business trip and you want to charge your phone, laptop and your camera at the same time, there is not much space in the nearby socket, what will you do with your single port power bank? What will you charge first? What if your friend runs out of battery too? Perhaps in such a situation, it would be better to make a wise decision by buying a portable charger with more than one port to charge your multiple devices and make your day. Battery capacity matters a lot. This depends on your requirement; whether you need to charge your phones or you want to charge more heavy duty devices. 10,000mah power battery is enough to charge your smartphones only, however, 50,000mah is a pretty good deal for charging a laptop, DSLR and other devices. Thus, there are plenty of options with the huge battery pack, for instance, RYNEP Power Bank 50000mah and MAXOAK portable charger. Safe and fast to charge your devices. It should be Intelligent Power Management IC supported, smart enough; to prevent from short circuit, over-charging, over-discharging, over-voltage, over- current, temperature control, surge protection and other battery damage incidents while charging. Further, a portable charger should be capable enough to serve a fast charging than any standard chargers. The best portable charger is the one that could be able to tackle all the weather conditions or at least strong enough when if it hits the ground, you wouldn’t end up picking its pieces from the floor. Therefore, it should be made up of good quality and unbreakable material i.e. there should be an ultra-protective casing. As a result of which, it should be shockproof, waterproof and dustproof. However, mostly power banks are covered with high-density aluminium casing or you will find an alloy covering, which is not weather resistant, although, it can bare shock of the fall on the ground. There are three different modes to recharge a power bank. Firstly, you can charge your portable charger via direct current recharge i.e. through USB input port; this port is compulsory and you will find in every power bank you want to buy. Secondly, is the car USB input; this facility allows you to recharge your power bank, meanwhile, driving towards your destiny, it ultimately saves your time. Thirdly, recharge power bank through sunlight via separate solar panel or in some power banks you will find its own panels, however, this mode is for the emergency purpose, in case, when neither there is a direct source of current nor you have the facility to recharge via a car battery. The portable charger you buy, it should have LED flashlights or OLED screen to keep you updated of remaining battery status. This feature is known as real-time power management, in which it will show how much battery is taking power from the socket via power adaptor and how much it is discharging when another device is connected (mobile phone etc). In some cases, OLED screen shows only the incoming power status while recharge and not the outgoing power status, when put into use. It is a fast charging technology found in your daily used devices, for instance, mobile phones, power banks, rechargeable cameras, fans and other rechargeable devices. However, when we particularly talk about the power banks, this technology enables your device to charge faster than its standard capacity of charging with its specific USB cable. In this way, it will charge your device in less time than the expected duration of the full charge and support better and effective performance of the device in the long run. Whereas, Qualcomm quick charge version 1.0, 2.0, 3.0, so on, supports 5V with max 2A max 10W, then 5V, 9V, 12V with max 3A, 2A or 1.67A 18W and 3.6V to 20V with 2.6A or 4.6A 18W, respectively. Hence, Anker Powercore 10,000mah poses this fast and efficient way of charging technology feature. Pass through charging technology enables the portable charger to refill or recharge itself from the wall charger via input outlet, whilst charging the devices (mobile phones, tablet, cameras, drones etc) from the other end. In contrast to this feature, there is a major disadvantage as well, that is, it might cause damage and deteriorate your battery cells and the device you want to charge too. This is because of the difference of the power the portable charger is taking directly to be recharged from the wall socket and the power it is giving (discharging) to your device, ultimately reduces the lifespan of both the devices. But if this facility is rarely used, probably in extreme need, then it might not cause any serious damage to the devices. This property is also called auto detect IC technology. Its function is to recognize the requirement of the current by the connected device. It is an automatic procedure, in which when the device is detected, this technology helps to deliver only that much amount of power to the device, which it can take easily without harming its battery cells. Whereas, this technology is purely different from the Qualcomm quick charge and it can not play its role either in its absence. However, Ravpower portable charger and EC technology portable charger are the power banks that bare this feature. There are two types of battery cells; lithium polymer and lithium ion. Whereas, lithium polymer battery is the best to store the energy in an effective way and can store a quite huge amount of power as compared to the lithium-ion battery capacity. How do charging pads work? Charging pads or charging stands are the new technology and the most innovative way of boosting your smartphones, however, this way of charging is only for the devices with the Qi enability, like the iPhone series with Qi technology. In this process, there is an electromagnetic induction between the surface (induction coil) of the charger and the receiver (induction coil) at the back of your smartphone that fed directly into your phone battery. The power bank charger you buy comes along with its accessories. In which you will find a USB cable and an adaptor to recharge it. You simply need to plug the big jack of the USB cable in the adaptor and small jack in the USB port of your portable charger, named; DC/input. Now just plug the adaptor on the wall socket and leave it till all the lights lit up on the head of the power bank (better to see the manual for the estimated charging time of the device). Note: Don’t ever leave your portable charger too long to recharge on the socket, it will damage the battery and shorten the lifespan of your power bank. Note: you can charge your power bank portable charger through your laptop instead of the wall socket or car USB port, in the same way, minus the role of the adaptor. I hope you have enjoyed this read and I have been successful to provide you plenty of information. What you need to do next is just go and click the links above and fill your cart with the best portable charger; a buddy to save your life. Fast and save charging is what we expect from our portable chargers whether we talk about iPhone or iPad, laptops or tablet charger. If you are only interested to boost your phones or tablet then Anker Power Core of 10,000mah battery is enough for you. It can facilitate you greatly everywhere in the home, office or at traveling. But if you are looking for something more than just a portable phone charger or you want your laptop to have a fill anytime; in this case, RYNEP power bank with 50,000mah battery is the best option to go with. It can keep your smartphones, DSLR, routers, laptops and tablets alive anywhere you want. On the other hand, where solar power banks are newly emerged technology and more updated versions of power bank, you can consider solar power bank too. It is perfect for adventure lovers and hikers.